This article is about the peninsula. For other uses, see Yucatán (disambiguation). 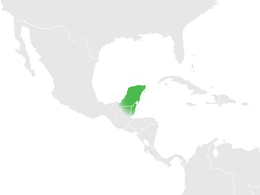 The Yucatán Peninsula (/ˌjuːkəˈtɑːn/; Spanish: Península de Yucatán), in southeastern Mexico, separates the Caribbean Sea from the Gulf of Mexico, with the northern coastline on the Yucatán Channel. The peninsula lies east of the Isthmus of Tehuantepec, a northwestern geographic partition separating the region of Central America from the rest of North America. It is approximately 181,000 km2 (70,000 sq mi) in area, and is almost entirely composed of limestone. The proper derivation of the word Yucatán is widely debated. Hernán Cortés, in the first of his letters to Charles V, the Holy Roman Emperor, claimed that the name Yucatán comes from a misunderstanding. In this telling, the first Spanish explorers asked what the area was called and the response they received, "Yucatan", was a Yucatec Maya word meaning "I don't understand what you're saying." Others claim that the source of the name is the Nahuatl (Aztec) word Yocatlān, "place of richness". The Yucatán Peninsula is the site of the Chicxulub crater impact, which was created 66 million years ago by an asteroid of about 10 to 15 kilometres (6 to 9 miles) in diameter at the end of the Cretaceous Period. Relief map of the Yucatán Peninsula showing major Mayan archeological sites. The Yucatán Peninsula comprises a significant proportion of the ancient Maya lowlands (although the Maya culture extended south of the Yucatán Peninsula, through present Guatemala and into Honduras and highland Chiapas), and was the center of the Mayan civilization. There are many Maya archaeological sites throughout the peninsula; some of the better-known are Chichen Itza, Coba, Tulum and Uxmal. Indigenous Maya and Mestizos of partial Maya descent make up a sizable portion of the region's population, and Mayan languages are widely spoken there. The peninsula comprises the Mexican states of Yucatán, Campeche, and Quintana Roo, as well as large parts of Belize and Guatemala's Petén Department. 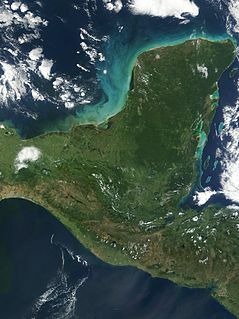 The peninsula is the exposed portion of the larger Yucatán Platform, all of which is composed of carbonate and soluble rocks, being mostly limestone although dolomite and evaporites are also present at various depths. The whole of the Yucatán Peninsula is an unconfined flat lying karst landscape. Sinkholes, known locally as cenotes, are widespread in the northern lowlands. According to the Alvarez hypothesis, the mass extinction of the dinosaurs at the transition from the Cretaceous to the Paleogene Period, the Cretaceous–Paleogene boundary (K–Pg boundary), 65 million years ago was caused by an asteroid impact somewhere in the greater Caribbean Basin. The deeply buried Chicxulub crater is centered off the north coast of the peninsula near the town of Chicxulub. The now-famous "Ring of Cenotes" (visible in NASA imagery) outlines one of the shock-waves from this impact event in the rock of ~66 million years of age, which lies more than 1 km below the modern ground surface near the centre, with the rock above the impact strata all being younger in age. The presence of the crater has been determined first on the surface from the Ring of Cenotes, but also by geophysical methods, and direct drilling with recovery of the drill cores. The Arrowsmith Bank is a submerged bank located off the northeastern end of the peninsula. Due to the extreme karst nature of the whole peninsula, the northern half is devoid of rivers. Where lakes and swamps are present, the water is marshy and generally unpotable. Due to its coastal situation, the whole of the peninsula is underlain by an extensive contiguous density stratified coastal aquifer, where a fresh water lens formed from meteoric water floats on top of intruding saline water from the coastal margins. The thousands of sinkholes known as cenotes throughout the region provide access to the groundwater system. The cenotes have long been relied on by ancient and contemporary Maya people. Short and tall tropical jungles are the predominant natural vegetation types of the Yucatán Peninsula. The boundaries between northern Guatemala (El Petén), Mexico (Campeche and Quintana Roo), and western Belize are still occupied by the largest continuous tracts of tropical rainforest in Central America. However, these forests are suffering extensive deforestation. Like much of the Caribbean, the peninsula lies within the Atlantic Hurricane Belt, and with its almost uniformly flat terrain it is vulnerable to these large storms coming from the east. The 2005 Atlantic Hurricane Season was a particularly bad season for Mexico's tourism industry, with two forceful category 5 storms hitting, Hurricane Emily and Hurricane Wilma. The 2006 Atlantic Hurricane Season was a typical year which left the Yucatán untouched, but in the 2007 Atlantic Hurricane season Yucatán was hit by Hurricane Dean (also a category 5 storm), nevertheless Dean left little damage on the peninsula despite heavy localized flooding. Strong storms called nortes can quickly descend on the Yucatán Peninsula any time of year. Although these storms pummel the area with heavy rains and high winds, they tend to be short-lived, clearing after about an hour. The average percentage of days with rain per month ranges from a monthly low of 7% in April to a high of 25% in October. Breezes can have a cooling effect, humidity is generally high, particularly in the remaining rainforest areas. ^ McColl, R. W. (2005). Encyclopedia of World Geography. New York: Facts On File. pp. 1002–1003. ISBN 0816057869. ^ a b c d Scheffel, Richard L.; Wernet, Susan J., eds. (1980). Natural Wonders of the World. United States of America: Reader's Digest Association, Inc. p. 420. ISBN 0-89577-087-3. ^ Cartas y relaciones de Hernan Cortés al emperador Carlos V (in Spanish). Paris: A. Chaix y ca. 1866. p. 1 footnote 2. Retrieved 2010-12-13. ^ "Ibero-American Electronic Text Series: Primera Carta de Relación, PREÁMBULO" (in Spanish). Board of Regents of the University of Wisconsin System. 1945. Retrieved 2010-12-13. ^ "Yucatán Peninsula". Encyclopaedia Britannica. Retrieved 7 August 2018.